With over 30% of Brits admitting their mother is the most important person in their life and half coming to realise they are indeed turning into their mums, it’s no surprise we don’t scrimp around Mother’s Sunday. If we let figures speak for themselves, it becomes quite evident what an important meaning we ascribe to this celebration – every year, we send over 30 million Happy Mother’s Day cards and spend one and a half billion pounds on flowers and presents such as jewellery, beauty products, and gardening tools. Pardon the cliché, but we all know this, of all holidays, should be the least about trivial gifts and cheesy Facebook messages. 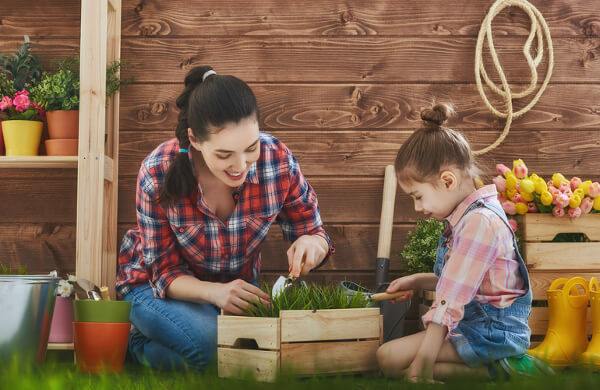 As we are about to celebrate the mum-praising day for yet another year, we decided to find out more about mother’s day traditions in the UK and what British mums really want for their day. So, here’s our collection of facts about Mothering Sunday you probably didn’t know and some mum-verified advice on how to make next Sunday really special. 6. The Perfect Mother’s Day Gift doesn’t Cost Money! Although Laetare Sunday – the fourth Sunday of Lent – had been associated with mothers and family since medieval times, it wasn’t until the beginning of the 20th century that a push towards an official day celebrating mothers in England was started. Constance Smith – a vicar’s daughter from Nottinghamshire, was inspired to start the Mothering Day Movement after reading an article on Anna Jarvis and her campaign for an official day to honour mothers in the US. Constance Smith was a High Anglican and believed that the liturgy of the Church of England for the fourth Sunday of Lent truly captured the idea of a day honouring mothers. So, when choosing the date for Mothering Sunday in England, she went back to the Laetare Sunday, which was when children who worked away from home received a day off to visit their mothers and the mother church or cathedral. In addition to Mothering Sunday, Laetare Sunday is also known as Refreshment Sunday, Rose Sunday, and the Sunday of the Five Loaves. Refreshment Sunday expresses the break from Lent which the Church takes, opening mass, allowing weddings, and waiting for Easter, as it is now closer in sight. There are two interpretations to the meaning of Rose Sunday – on the one hand, priests are allowed to wear rose-coloured liturgical garments instead of the traditional violet ones, and the fourth Sunday of Lent was also when the golden rose sent by popes to Catholic sovereigns was blessed. Sunday of the Five Loaves, as you can easily guess, refers to the feeding of the multitude and the miracle of the five loaves and two fish. What makes Mothering Day different from Mother’s Day is not only the name. In the US, Mother’s Day was proclaimed in 1914 by the President Wilson to be held on the second Sunday of May, the day being chosen as Anna Jarvis’ own mother had died on the 9th of May. Choosing the date for an official day in praise of mothers in England was religiously conditioned to be the fourth Sunday of Lent, so now Mothering Day is on a different date every year, depending on Lent calendar. Laetare Sunday was the day when the Church took a breath from Lent rigours, children working away from home were allowed to visit their mothers, usually bringing flowers, and families got together for celebrations. The Industrial Revolution changed drastically the lifestyle in England and Mothering Day was one of the traditions lost to the new ways of society. In addition to picking flowers to hand to their mothers at home, young girls working as domestic servants also brought products from their masters’ larders to bake a special Mothering cake or Simnel cake – a fruit dessert topped with marzipan and decorated with flowers, either fresh or crystallised. Simnel cakes were one of Mothering Sunday traditions in the UK which outlived the Reformation. During the Victorian era, little marzipan balls were added as decoration to symbolise the Apostles. Later on, Constance Smith re-introduced them again as part of the day honouring mothers. Nowadays, these rich almond cakes are also called Easter cakes. Things have changed a lot since the Mothering Sunday of the 17th century when working children had this day to reunite with their mothers or the 1920 Mothering Sunday Revival of Constance Smith when many mothers were mourning the loss of their sons in the First World War. Nowadays, the way we honour Mothering Sunday in the UK is similar to Mother’s Day celebrations around the world – with flowers, cards, and gifts. Mum’s the word in the morning – if a mother tells you she really doesn’t mind getting up earlier than anybody else, she probably has some other secrets such as store-bought biscuit dough. Every busy mum would relish the chance to sleep in on a Sunday and this doesn’t really cost you anything, does it? Take the cleaning off her hands – find her chore list and get the whole family together to tick each one off, so she can really enjoy a special day. Yellow rubber gloves have never been a number-one choice accessory for special occasions. No mums allowed in the kitchen – trust us, your mum wouldn’t really like to spend her special day slaving over the hot stove, regardless of what she says. She’s a mum, it’s what they do – making us feel like it’s all okay even if it’s not. But not one or two mums have shared that they would really like to go for a picnic or a brunch outside for mother’s Day. So, you better hurry up with the reservations. It’s her special day, let her enjoy it. Sometimes, the best you can do is nothing. Simply take the chores and errands off her hands and allow her to indulge in some quality alone time, whether it’s a hobby, a book and her favourite drink, or just a nice long bubble bath. See, it doesn’t really take that much to make something special for the person who gave you life, taught you how to use a spoon, and still thinks you’re pretty no matter how bad hair day you’re having.